Tempeh is another one of my favorite food. Its made by a natural culturing and controlled fermentation process that binds soybeans into a cake form, similar to a very firm vegetarian burger patty. Its a traditional soy product originally from Indonesia. In my opinion, tempeh is a perfect meat subtitutes; it has a very versatile taste and nice texture, very much meat-like. Back in my childhood, my family meal always consist of a piece tempeh, toffu, meat, veggies and rice. So, I can say I ate tempeh everyday. Today i will share one of my fav tempeh recipe; tempeh tempura! 1. 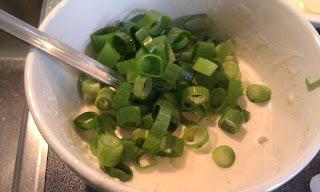 In a mixing bowl, add all the ingredients except the scallion and tempeh. Make sure you get the batter consistency you'd prefer. I made mine not to liquid. Meanwhile, heat the oil in a pan. 2. Once you get your batter, add the scallion and mix it again. Dip your tempeh and make sure its nicely coated. 3. Fry the tempeh until it turns into nice golden. PS: It is better to have the oil at least cover half of the thickness of the tempeh. 4. Once the tempeh turns golden, put it on kitchen towel or oil-absorb paper. 5. 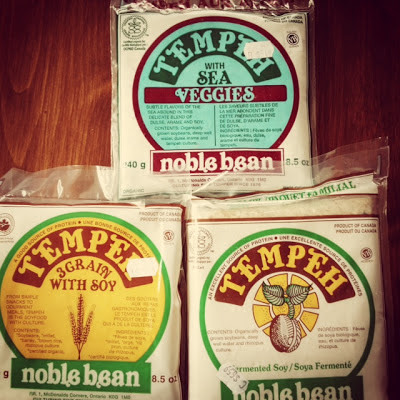 Now your tempeh is ready! Served better with some kind of dipping like Sambal oelek.